The Castle and Regimental Museum, Monmouth, holds the records of the Royal Monmouthshire Royal Engineers (Militia). The Regiment was formed in the sixteenth century and the records cover the period 1786 to 1991. 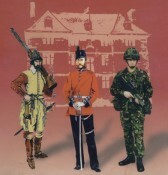 The Regiment was originally a local militia and is now part of the Territorial Army. Throughout its long history, it has always been a reserve force, composed of men with ordinary occupations who were brought together at intervals for training, and were called upon for active service at times of need. It is the senior regiment in the reserve Army. You can find out more on the history of the Regiment on the museum website and about the Regiment today on the British Army website. Most of the changes in the title were just changes of name. However, the change in 1877 was a major one as at this date the Regiment was converted from an infantry regiment to a regiment of engineers. More recently, units from the Regiment have served in Bosnia  and Iraq (2003 and 2007), but the records of these periods of mobilisation are not held as part of the Archive. As well as the Regimental Archive (that is, the records of the Regiment itself) the Castle and Regimental Museum also holds other smaller archive collections which have been donated by other organisations and by individuals. Find out more about these here.